I have mentioned more than a handful of times that I have grown this thing for Kanebo lipsticks (Sayonara, Shiseido, I never liked you anyway): Their formula, packaging and just the shape of the bullet (not to mention their color selection don't usually go wrong). After dabbling into Suqqu, Lunasol, Coffret D'Or and Lavshuca...I started to set my greedy eyes on RMK, another more expensive Kanebo brand that's on the same price range as Lunasol but with more modern and edgier vibe. RMK is (like most of the aforementioned brands) is not easy to get in US. It has its counters splattered allover Asia and at UK so once in a while, I see one or two shades on eBay without crazy markup. 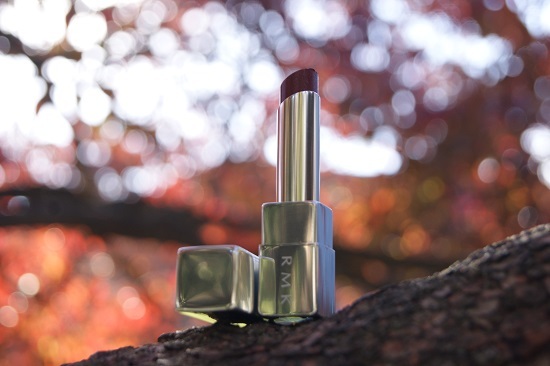 Irresistible Glow (I kept thinking it was Ingenious Glow) Lips EX-06 is one of the limited edition lipstick from Fall 2015 Urban Gold Collection. I didn't think much about the color at the time, I wanted a RMK tube and to test out the formula a bit. The RMK had the exact same dimension as Lunasol lipstick but the lighter color makes it look clunkier. The cap closure is lower down so it also look fatter proportionally. Overall, the tube doesn't look bad but I find Lunasol and Suqqu more aesthetically pleasing. EX-06 is a dark reddish brown with warm red and golden glitter. The glitter particles are big, abundant and don't vary much in size. It's looks like a lipstick that Kim Hee-Sun (back in 20th century, she was considered the most beautiful Korean actress at the time) would wear in one of those 90s K-Dramas. I changed my mind as soon as I wore it on my mouth: Despite the deep color and glitters, the lipstick has a very clear and glossy formula that makes the color much more forgiving. It reminds me of Maybelline Color Sensational Lip Gloss in Bronze Beam, in a way both color are surprisingly wearable and flattering on the lips. On my lips, two layers of EX-06 show up as a glossy reddish brown that's so popular this past two years. The formula of Irresistible Glow Lips is one of the best I have tried, instead of drying to a soft balmy layer, I actually find it actively quenching. I wore it during one of days when it was below freezing with wind chill, my lips actually stayed moisturized the whole time! At 3000 yen a piece (a few bucks more than Coffret D'Or), the formula is well worth the retail price. Since there are several bright (and shimmer-free) shades available, I am thinking about some bright red and pink next time. Another picture with dimmer lighting as the sun was setting. Me too! I love reddish browns! Isn't that straight up gold glitter? I am sure it will turn out wearable but hey...I would save it for everday color though,since I want to get lots of uses out of them. Oh sh*t, it's Irresistible Glow Lips (the ingenious is for their powder stuff that I have been eyeballing)... Damn I mixed up lots of name this year. I have eyeshadows and a cheek color. And last year's holiday palette. All gifted by a good friend, though. Beauty Bay shipping isn't so bad. I ordered a few Illamasqua things right before Christmas and reveived them yesterday.